With days to go before the next presidential election in Venezuela it is time for a final look at the polls. The new polls are just as murky as they have been all along. Most polling firms have released -this past week- their latest studies as, per Venezuelan electoral law, it is illegal to publish polls after this past Sunday 30th of September. These last polls maintain the wide ranges that go from a 20-point lead for President Hugo Chávez to a 2-point lead for the challenger, Miranda’s Governor Henrique Capriles Radonski. As such it is still necessary to see where the race stands, when controlling for biases. First, let’s briefly review the previous post. I argued that polling houses typically tend to err in one direction, which allows us to determine a measure of bias with which we can correct current predictions. Second, I highlighted two scenarios from the previous electoral contests: 1) A scenario where the polls had the opposition ahead, but the government won (like in 2004 and 2009); and 2) a scenario where the government was thought to be ahead but where the opposition ended up winning or coming very close to doing so (like in 2007 and 2010). These two scenarios served as the basis for two measures of “correction” for current polls. A third measure of correction was based on the average of all errors for the previous elections. These correction terms can be seen in Table 1. First, I was recently reminded that previous to my original post I read a note by Francisco Rodriguez from Bank of America which did a historical analysis of elections and generated a prediction. While the averages we use are different, and give quite different results, it is fair that I make this reference to his work. Specifically, he uses a measure similar to my third measure of correction which averages all elections. I think this is not the best correction since it cancels out errors from elections with different dynamics. That is why I provide a 2009 and 2010 scenario. Second, last month I explained my decision to use the average of errors within one election rather than just their last poll. I claimed, and hold, that it was a decision I made as an analyst not to use only the last poll because pollsters gave very differing views of the race throughout the campaign and as such that needed to be waged into the bias. However, as we are now in the last week of the election, besides doing the same analysis as before (with averages), I am also going to analyze bias based on the last poll of 2010. I do not have enough polls to do do the same calculation for 2009. However, as I mentioned in my first post, I consider 2010 the more likely precedent for this election. Table 2 shows the pro-government and pro-opposition error of the last poll by each of four firms. The disparity in these biases is due to the fact that a third party (PPT) managed to get an important number of votes. Since my last analysis at the end of August, several new polls have been made public; most of them from the last week of September. 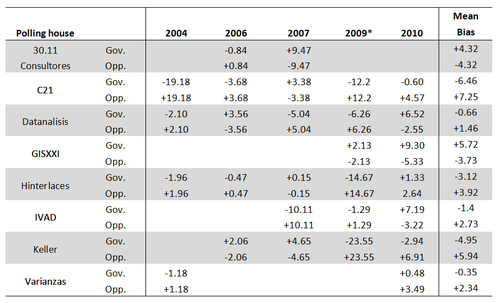 Table 3 shows the predictions with the dates of each poll and the three corrections mentioned above: the 2009 correction for the scenario where the opposition underperforms its poll numbers, the 2010 correction where the government underperforms, the mean correction, and the correction based on the last poll for the 2010 election. As can be seen in the 2010 scenario, the most competitive—and I think the most realistic—no pollster has Chavez with more than 50% (after the correction); the highest is Varianzas with 49%. With regard to the opposition, the sole pollster with a corrected prediction for Capriles under 30% is Hinterlaces; otherwise, the polls point to somewhere in the 38-48 range for Capriles. 1) Chávez remains below 50%. His mean numbers remain stable as well as the range, i.e. pollsters are agreeing on where Chávez is. 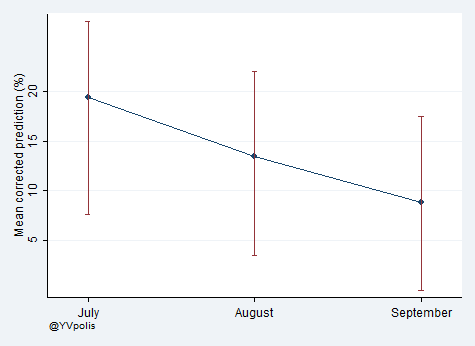 2) Capriles’ numbers have increased from around 34 in July to around 40. Considering that Chávez is at 46 this makes the gap only 6 points. Unlike Chávez’s numbers however, the uncertainty (the range) around Capriles remains extremely large, which implies little agreement amongst pollsters. Figure 1. 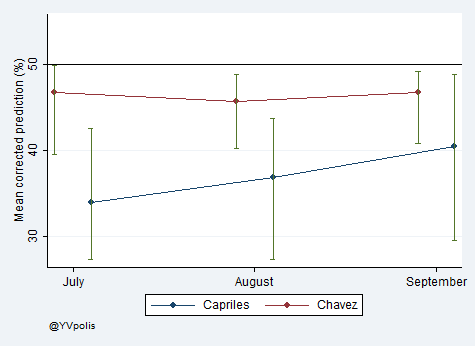 Mean and range of corrected predictions (2010 scenario) for July, August and September polls (The horizontal separation between Chavez and Capriles for each month estimate is done solely for the purpose of a cleaner graphical representation as there are only 3 points in time when this was done: July, August, and September). As it stands the race is extremely close. A six point difference is not only very close to the margin of error of most polling firms but is also well below the number of undecided voters which averages 10%. While there is only one week left before the election most of these polls were fielded in early to mid-September. With Chavez remaining static in the average and Capriles climbing the only safe assumption to make is that throughout the course of the campaign undecided voters have mostly sided with Capriles. Figure 2 shows the evolution of these undecided voters in each of the three rounds this analysis was made. As it can be seen there is been an almost 10 point drop in their numbers and an almost similar rise in Capriles voting intention.